how many voices can the microQ do and what about the DSP-power??.. go HERE! UPAW wavetables.. how to make some..? 1) Use the UPAW assembler which is available as open source on the FTP-server. 2) Use the Polyframe (atari ST, was what is now sounddiver) Adaption georg müller created back in time for the Atari. 3) Use a Hex-Editor to code the SysEx directly. but normally you can use the ones,that are already in: FM, and some more using sounddiver. upaw is a mathematical forumla, that discribes the waves and wavetable transition.. so it does not need space for waves. need more LFOs? set an Envelope to Loop between Attack and Decay1 and route it to the desired destination and set their rates to very low amounts (try the lowest and go ONE step higher)..
>but the MW1 waves differ from that on the MW2 that way that they have a whole cylce not a half mirrored one!.. but this is not a problem I guess.. Both have half-cycle waves. The MWII *can* play back full-cycle waves, but all waves that we took from the MW1 are still half-cycle. I still don´t know why this limitation…? it is prepared but not yet able to do so…!! wanna turn on all the lights (LEDs) of your Q? press osc edit + mix edit when startup. welcome to the system testmode. ..press play/ok and play with the dial to turn on/off every single LED. But there it is a matter of design and calibration. Some PPGs do, some don´t, the latter is correct with regards to the service manual. >Since the MWXT sends all it’s controls out via MIDI, can it be used to remote edit an MWI. No, the sysex format of the machines is completely different. The cause: the sysex messages for realtime parameter changes are much shorter on the MWII/XT to keep MIDI traffic as low as possible. I’d like a nicer way of the naming procedure.. maybe use the keyboard or like on the TG77 the phone-style of naming.. much faster than those things currently in most synths..
„drop out“-like CLICKING&crackling in the Q?? : the problem is going away for most people when they’ve switched to „DAC Format 2“. nothing, or send Controller or Controller + Sysex. Recv is „On“ or „Off“. Check to be sure that Recv is „ON“. It MIGHT default to „OFF“. IF you want to upload a new OS into the Q it might work only with this: power it up with peek+multimode buttons pressed.. it says: dump system now and shows a „thermometer/progress bar“.. also: slow down tempo of the sequencer, enable sysex in the sequencer.. there have been probs with cakewalk.. cubase seems to work fine (get a demo if anything fails..).. I had no probs with Logic,too..YOU SHOULD HAVE AN OS AFTER 2.15!! it is the OS thats works for all.. or NEWER!!.. and watch out you got the latest BOOT OS! How about selectable envelopes for the Amplifier. Presently the Amplifier Envelope is fixed to the Amplifier but it would be nice to switch off the Amp env and use LFO or Wave Env..etc to Modulate the AMplifier. I think the present work around is to set the amp env to 0,0,0,0 and modulate it’s sustain by the above sources…plus the needed bipolar offset….however this is not obvious to most. Also individual time and amp levels of the wave envelope as modulation destinations….maybe just the first 5 would be adequate. This will make ramp generator emulations and such more interesting. Other interpolation strategies between waves in a table than linear, also as an option for a wavetable (let say : linear,polynomic,cubic splines,some weird waldorf suggestion etc.) . just to re-tell it: I still would like full cycle waves!!.. and the rest of the ROM filled up with some nice stuff..
-the noise source would be SO much more useful if you could shape its frequency response, even just a little bit. All you’d need to do would be to provide the option of putting the 6 dB filter after it instead of after the main filter. A BPF option on the 6 dB filter, if you could reposition it, would be really helpful too.. should be a source for FM, too. what about blue,red,pink noise..? maybe it is possible to do random wave, anyway but I guess its hard work.. I suggested those chaos things like it is in the EMU morheus for LFOs, too..
is there any change to get different types of noise oscilators for the Q and also for the XT in any future system update? theory in is not a difficult function to create nor a complex waveform? Maybe the sample source of the MWII’s S/H waveformis the problem? If „Fine Tune“ or „Unison Detune“ were modulation matrix destinations, then you could get really subtle in this area. I think they both have their strengths. I like the non-quantized knob movements of a true analogue but I like the reliablity, convenience, and power of Analogue synths and some digital synths with MIDI…the Pulse MWI and MWII being three examples. I think the problem is simply analogue emulators are starting to get very good (and will only continue to get better and better) yet the midi 7bit 128 step per knob is sonically limiting. what about to add more „space“ to the filters? what do I mean? : well I think that 128 sometimes isn enough.. and that may be true for some other parameters as well..
maybe this is a possible workaround and I would not need it always.. so why not flexible and modable freely.. so there is not mod problem or so.. If not then maybe this should be looked at in the sysex implementation being developed. 1. I must be compatible to the old 128 ..
btw: there is still some room to make them a little faster says Wolfram Franke (developer at Waldorf)!! LFO speed – more ideas: tapping in speed maybe tap tempo function for arp-speed as well? modulatable FX (mod matrix..)… most wanted: dry/wet CC / play access params. modulatable by midi clock.. (ecspec. delay) / BPM measure?? the Q already has it ;-) is it possible to include it as a mod. destination in the future? Those things will show up on the Q. But on the MWII, it is not sure. The reason is absolutely simple: this destinations are monophonic while the mod sources might be polyphonic. And this structure isn’t that easy to implement. However, realtime parameter changes for the effect parameters are possible (if not already implemented). They only don’t send out their values at the moment but Stefan said that he would have a look at this. the RAM in XT, perhaps even in MW2 is enough. A vocoder does not need a lot of memory. but. a vocoder is *a bit* :-) (too much) more to do for the DSP..
And a vocoder will of course need some calculations, if there is not enough left I will sacrifice some voices. yes!!! this is possible.. I’d like to sacrifice some of those 30 voices for more synthesis stuff!!!.. It should be possible to feed an external signal in when in multimode and have each instrument on the same channel but with no Waves, Noise or Ring mod assigned in the Mixer. Just choose a cool filter for all 8 (16) instruments. set it to keytrack at 100% and offset each. Bandpass and FM will be cool. If you use FM, be sure to offset OCS B for each instument so that you can cover an octave or two. This will give pseudo Vocoding (interesting) results. what about a TRACKING GENERATOR in the Q/XT.. as seen in my beloved Xpander?.. you can do nice things with it.. eg: scalings etc.. (would fit nicely with wavtables etc..).. also makes it much more „human“.. I used that one on lfo speed.. its really feeling sooo nice..
free assignable CC to each Knob of the XT & Q (..).. for use as aknob box / Controller for other gear..& local off for the CCs!! (so it leaves the internal sound unchanged).. ok.. if you use another free „empty“ multi.. thats also possible.. but would be nice..
what about a comb in xt, too? Sorry, impossible in the XT, not because of DSP Power but because of DSP RAM for the delaylines.!! Yes it’s true It’s not always a solution to reduce voices!! for getting the comb thing it is an issue of RAM.. and this is only enough in the Q.. this is why I vote for another expansion „more RAM for XT + voices“ dunno if this is economicly ok.. but for me as a user and synthesis junkie it IS! but: It is *NOT* possible to add fast RAM to the DSP of the Microwave II/XT!.. so the sacrifice voices may be the only power saver.. The XT doesn.t have enough dsp ram for having the Q comb as filter, but *maybe* it has enough effect RAM to have the Q comb as effect ??? Sacrificing Multiparts / More Multis??? More parts don’t need more DSP power, only a little more RAM. On the Microwave, it would need much more RAM because of the wavetables but on the Q, it is fine. (This implies: Comb on XT is becoming harder to do for this 2nd reason!) BTW: it makes a lot of fun to use drumsounds from the Q and then you need lots of parts. What „neat feature“ would I like to see? The S&H filter with a high pass or bandpass instead of a lowpass. Ah- the K5k also has an Even/Odd Bias knob.Very handy!.. also.. what about other harmonics filter 3rd? 5th.. or combination??.. I loved that in the morpheus..more wishes..: and more like the waveshaper and some easy handy harmonics filter (the K2k / K2.5 has that,too and it is cool there, too) Ya- the K5k has a Formant Filter too, mainly to make up for some additive shortcomings..
Harmonics odd/even is POSSIBLE in the Q: You can do an odd harmonics filter on the Q by applying 100% keytrack to the comb- filter, matching the frequency and setting Resonance to 0, only odd harmonics will pass. Same settings, comb+ and only even harmonics will pass, which results in a tone one octave higher. DSP of the XT.The reason that comb filters will not work in XT is that they need some memory, and the MW2 does not have enough of this. Stefan: As I said, no matter of cycles but a matter of memory, so sacrificing voices will not help. it might be that even when it is reduced there is not enough power left.. ok.. but this is one of some ideas.. and sure they will implement some more filters / combinations (that make sense)..
another way: switch of the 2nd filter, too .. so we would have: less voices one filter uses power of Filter 1 and 2.
official answer here is: sorry, the 2nd filter is not modular, so it cannot be left out.!!!!!!!! is it possible to get a room / reverb? W answers: Perhaps in the XT, but certainly not in older MW2. The Q will surely get one.. one of the next updates..
what about the cool XT – BPF in the Q too.. you need another parameter (as the extra parameter in the XT) and you got 2 nice adjustable BPFs (modable quality/range then.. instead of using LPF & HPF..) and anyway: there are some filters in the XT that could be ported to the Q!!.. and I still want harmonics filters. ahh.. btw: I can do it with the comb!! Mod’in filtertypes?? one thing that the sp808 can do that is even tedious to set up on my Nord Modular is that it’s stepsequencer can mod various filter types per step (ie choose a different filter type at each step). i don’t know if this is at all feasible on the Q, but I would really like it to be – it really adds life to sequences.i know that i can approximate this with routing/balance/LFO’s/env’s, but it would be really cool be able to choose filter type per step, at least for one of the filters. anyone else want this .. ? supersaw and the like.. hmm.. not on top of my list.. but just another idea..
a set of mod’able BPFs feeded by noise.. (as much as possible.. the Z1 has 5) well.. I guess you can imagine what you can do with this!! ;-).. hope this will be consider to be in the Q also..workaround: refeed a Q voice and use the now 4 BPFs plus the normal OSC set.. not really cool but..
and Wolfram said something about the Wave (2).. maybe there will be some sideproducts.. after that..?? I’d like to have some of these XT filters in the Q , too…(as said..).. as there are Wavetables and 2 Suboscs.. the Waveshaperfilter should be possible when using the ALT Waves.. also: S/H modable sampleratereducer plus filter as in the XT.. better than in the FX section!! MORe Q thoughts… 4op FM is cool.. I guess that could be done.. (DSP?!?!?!!)? also some slow LFOs maybe just one waveform?? I’d like to set the duty cycle of the other waveforms (for: sine,saw->tri.. =“Symmetry“)) via the PWM CC..
hmt (hermode tuning) which corrects all played notes to the real „correct“ clear tuning.. like: tuning the 3 OSCs as an accord.. disappeared from the MW2/XT(k) and Q/RaQ.. why?? (licencing issues & money.. I know..).. but it was cool..
btw: and it has its own dedicated DSP only for FX so: why not?? maybe we could have some moadble resonator things.. (done with reverb).. I do not agree with „only very good“ or „no reverb“!!.. you can call it cheapREV and everybody is happy.. there is always more than duality!!! (on/off!!!).. some nice OSCmodes (valid for the Qs alternate Wave,too..) like superSAW or the like, spectral things, additive?? what about this in the Q & XT: I’d like to use the expansions power for modular synth / more synthesis power (additive? 4-8 OP FM, granluar?,formant things, harmonics…).. and having a „just bought / newbe OS“ including demomode etc.. to be exchanged by a real demomode-less OS to get more space for real synthesis things.. etc.. maybe a complete OS for turning the machine into say: additive synth etc… (c above)..
a local off for the knobs! > >speed and then apply any kinds of functions. data from the old PPGs or it was allready there. By this you gain 6dB. no more problems with IBK10 Control (needs all CC to be send for relative control!) is implemented now. Deopfer Drehbank but it has no display and no Mac Editor (SHAME on you!!) and of course no relative Mode! but 64 Knobs! -does not need this feature. a genreal Idea: All Parameters should be available through CC.. and if the 128 Midi Controllers are full use one as a Shift and you have got double, use as 2nd Shift and you get another 128´s Set… SysEx causes too much traffic.. mostly this is reality in the XT / Q..
at the moment use play params or the mod matrix (any source in the matrix).. till it is implemented.works fine.. so it is not really urgent..
256 kbit EPROM type 27C256 250nsec the OS is available on waldorfs ftp site!! couldn’t be supported then. Then we would have two different OS’s for them which isn’t what we want. > Is the 4-Pole the same filter as the Pulse Pluse in? but it still happens. When I edit a random patch to make it more to my taste, what is stored is not always the same. In particular the envelope settings and maybe the wavetable / envelope seem to change slightly. to happen with randomized sounds. In particular the things that seem altered are the filter settings and the envelope. I could be wrong. I think it usually works OK if I save the randomized sound straight away after randomization, and THEN edit it and store it again. STEFAN:Yes, I think I found the bug, the wavetable was not loaded correctly. The fix will be in the next update. >Would a true stereo input to the XT be possible in a future software upgrade, or is there a hardware obstruction to this feature being implemented? It is planned to support selectable inputs for the external in of the mixer section, like stereo, left, right, … where stereo is only true stereo in dual mode and left+right in normal and unisono mode. > I would support the call for alternative user tunings (if this is not already possible)… since I use quarter tones quite a bit. Tuning Tables are of course possible in Mw2/XT, but we have not yet planned to implement these. Speaking about quarter tones, you can do this by setting the Osc keytrack to 50% . Plus the ability to copy, create or randomize wavetables. >I vote for some basic UPAW editing (let say the FM stuff with some basic envelopes) for Onboard editing. That’s a good idea. I had this idea for the big Wave in the past but the number of parameters just seemed to make it impossible. But having it limited to only a few parameters could make fun. >One operation I forgot about is initialise wavetable i.e. set the first wave to a default (sine?) wave and the rest empty. >I also had a few thoughts about randomize.“Density“ parameter: the percentage chance of a wavetable position being set to a wave (as opposed to being interpolated). >Restrict waves: ROM waves only, User waves only or ROM + User. Alternatively, a high-low range of waves. invers babelfish. This has to be fixed in another firmware update. by the MW when it receives a special SpeechTable Dump. and then sends the tables to the Microwave. Perhaps Wolfram can compile this into the FAQ ?? be a nice touch and an efficient use of real-time controllers too! correct me if I’m wrong). > sort of very weird & wonderful sampler. the wave_env applies for the whole ‚long wavetable’… possible? >>(like assign two completely different wavetables to the two oscillators). multi timbral and has to stay there. just as fast as switching wavetables would be ok for me. (except for some minor exclusions like the delay time in the fx section). numbers for these time based things as well as for some other parameters. ever thought of an envelope follower for the external input? you need more for one sound? why not put the output back to the ext.input again and put some additional filters on it? modulation sources in the matrix. guitar lead might lend itself to some interesting possibilities… Marzzz? on LEFT_IN and use it as a source for filter cutoff or resonance. I think it would be nice if an extra parameter was added….gate time.This would represent key down duration. It is very useful musically….food for thought. Hope you manage to put it also as target in the modmatrix…..
We had a discussion on this about a year ago : Wolfram said at that time that there was not enough memory for this. This is only true for a step based gate time. But maybe we can introduce a global gate time so that you can shorten or lengthen the whole arp rhythm. This is already very nice (we have it in the Q ;-)). Q: The drum synth isn’t implemented but instead of that, we gave the Q a 16 part multi mode. Most of the time this is enough to do drums on e.g. 8 parts where you still have 8 parts left for other instruments. I am not sure when we implement the drum synth but I hope to see it at some time. I vote for some basic UPAW editing (let say the FM stuff with some basic envelopes) for Onboard editing. > >> That’s a good idea. I had this idea for the big Wave in the past but the number of parameters just seemed to make it impossible. But having it limited to only a few parameters could make fun. > >Ehem… The Wave has no UPAW at all. AFAIR. > No, but it already has AW. Stefan only didn’t program the UP part of it, or in other words, there is no sysex support for algorithmic wavetables yet. lets generate some sounds randomly and decide a „generation“ to survive.. and you should be able to choose that eg: the OSC or some settings will not be changed.. so you´ll choose what will be randomly generated and „good ideas“ (greetinx from Darwin?) will able to have „children“ and you then choose good ones.. the machine can now determine more and more what a „good mutations“ is..
and: two sounds should be „mixed/morphed“ by interpolating like this: choose 2 sounds.. press interpolate/morph.. and you´ll have a nice mixture!! their parameters in random ways. better, mutation could be allocated according to parameter groups. Group mutation to 25% before you hit the ‚Next Generation‘ button. design space in a non-random way. > simple 3oct keyboard and some purple paint. Call it the MicroMono. my Ju6 and ESQ1 (ESQ is not easy to do! !…) so I believe that!!! should sell for a LOW price –> PULSElike?? but you are right – a good idea (I would call it the Emu/Ensoniq-technique)..
and XTs from that money they would earn?? but mono?? please no more monosynths! aren´t there n.off??? > just got a microwave xt — what an amazing piece of equipment. > MacOS, and if so is it any good and where can one find it? this question is asked frequently: its name is Emagic Sounddiver..
use the last 2.0.6 version and have fun!! >I have a problem with my microwave 1(Software 2.0). >I can´t get it to respond to Midi Clock. >I use Logic 4.0, set it to send Midi clock to the output of the microwave. >but nothing happens when I change the tempo of my song. Waldorf Pulse, Microwave II or (soon) the Q. But, there is a light at the end of the tunnel: In your sequencer, just build a controller ramp with i.e. the ModWheel of i.e. one bar with the shape you need, i.e. saw or triangle. Copy this controller ramp to as many bars as you need to have it. Then use this controller to modulate what you need, i.e. cutoff. Works perfect. the naming thing: yes – I dont have any synth that has a good name input feat. it simply take too much time.. maybe the TG77 has got a nice solution it’s the fastest of the slow: you’ve got the number pad with 3 letter.. press as long as you get one of the 3 or the number.. this is the quickest and I’d like to see it on other synths..
buttons are better the knobs in this case!! The BEST one is: using / attach a simple PC Keyboard as on the EMU Samplers.. planned: that the sound name can be inserted by pressing keys on the keyboard where the low „a“ is the alphabetic start point. Similar as on the Wave. Right now, you can put *unique* effects on 4 of the 16 voices. If you put effects on voice 1.1, all other voices in that bank will have the same effects (1.2, 1.3 and 1.4). Same with banks 2.x, 3.x and 4.x. I only have 3 banks (A001-A100 / B001-B100 / C001-C100) – or am I understanding you incorrectly?? Yes… sorry about the confusing. When i talk about „banks“ I mean the 4 instrument keys above the display. Maybe „instrument“ is a better term. why I’ve written this? : The next OS will have effect bus routing and output support. AND: it will send/receive CCs .. they will be routed quite intelligent: you can remote some Waldorf Synths (XT,Pulse) by simply turning the same parameter on the Q’s panel..
>As the Q has no noise as osc (but a separate Noise gen) it is not possible to take noise as one and eg saw as the other source and FM them! or is there a way to Freq modulate some basic wave .. say saw (at OSC speed like a noise gen!!) by a full speed white noise (not an LFO with noise waveform!!).. or is there some workaround? eg.. the noise fast mod’s some osc.. and that osc is mod’ing my saw then.. resulits in what I wanted..!! * Noise !!!!!! here it is!!!! * Audio In (under development) this will be great!!!! * + other modulation sources like LFOs etc. wolfram you perhaps should put a VERY LARGE FAQ button on the waldorf site (on TOP)!!! including the voices thing etc..
-You can’t disable program change reception on the XT. Anyone faked this with Logic ??? In short: a multi -relative- edit!! this Idea should not be forgotten..
A keyboard usually has no MIDI In LED. But Waldorf plan to have a „info“ display with bar graphs where you can view the activity for all 16 instruments at once (Q!!). a Knob Box mode (XT,Q) would be nice: „somekind“ of Local Off: you can turn them.. and it sends CC (Continous Midi Controllers) to Midi but has no effect on the XT in multimode.. some workaround: choose a „null patch“ as instrument 8 (don’t say you always use all 8!!).. always set it into multi that you can select the instrument / do it via your sequencer.. Currently there is no panel „local off“ mode. I hope it will appear one day. I also hope _all_ the knobs will transmit MIDI CC too. Another wish: to work out how to send patch „recall“ sysex string. Much of my stuff uses Control Changes and each time I restart the song, I must manually Recall the patch as it should be before it starts changing. Anyone make the sysex for this work? I attempted to record the results of doing it but no joy… preferable as a CC! Shift-Utility, set sequencer into record (where you want the patch saved) and hit Shift-Utility again. This saves the sysex string for the patch independent of any patch location in the MW. Will reload into the edit buffer. Is this what you were looking for! Any other Q users able to confirm that pan is reversed on the Q (OS v1.08)? Possible. Will be corrected with the next big update. * How do I assign the keyboard to several MIDI channels at once – i.e. for layering and or cross-fading via keytrack? Will be available with the soon-to-come Multi Edit. how to do a legato mono patch. Env Mode (Shift-Release) gives the „Not yet available“ message – that’s where I’d expect retriggering options – and there’s no mono insttrument setting that I can find. >* Waldorf, please consider adding some tiny visual indicator to the LCD display to indicate a difference between a current setting for a parameter and what that setting stored in the patch is (i.e. not just the Compare which does all parameter changes). I got very used to the DW-8000 using the decimal point to indicate that a parameter value was different to the one stored in the patch – if the tweak doesn’t do what you want, you just move the slider until the dot disappears to restore that parameter setting. Is planned but has a lower priority at the moment. plus the „where to store / is it „free“ organization: maybe it’s fine to have compare/recall and some editbuffers… like the XT..
>* Waldorf, I’d find it really useful to be able to see (e.g. via scrollable LCD menu) a list of the destinations that a particular source is modulating. It’d help me to work out if an LFO/EG/etc is free more easily. At the momoment I have two options – changing the LFO and listening or Peeking at loads of different Mod source buttons (often have to Shift to see them, too). destinations. But this also has a lower priority. Storing sounds and, in the future, adding new synthesis modules. Even updates could be stored on cards. 50-100 sound can be stored on a card.. maybe the capacity is increasing.. Someone had mentioned that their Q had once powered up with the symptom of just hanging on the initial display, (the copyright/smiley face). This happened to mine this morning, and I thought I’d share what I found caused it. When the machine powered up, the display stopped at the initial display where the serial number is shown. Nothing worked, no other panel lamps were lit. I had to unplug the machine to get it to power down. I seem to remember Stefan or Wolfram mentioning some time ago about a fail-safe boot in the MW XT that would force the machine into a state where it’s sole purpose was to listen for an OS dump from MIDI. I’m thinking that this is what happened to me with the Q (it’s quite repeatable) and I’m wondering if this is what the other person who had the hang saw. so: updating an OS is *absolutely* harmless, since the update-function is located in the BOOT-part, which is not touched during an OS-update… ;) In the case OS-update crashes anyhow, simply press&hold ‚multimode‘ & ‚peek‘ buttons during power up, you will get: [Please Dump System] ! > Yes, there are some glitches with program changes on the current rev. It is fully understandable when you are changing a X.1 instrument, because the effects on instruments in the same block (X.2, X,3, X.4) will change too, and you will hear that change. (not really a glitch, though). > There is another little glitch where for some reason I have not figured out, patch AXX will suddenly become BXX, or some other bank change will randomly occur. The number in that bank stays the same. I really want to know how to do this on purpose! But right now it just happens on accident, I have not been able to narrow down a cause. it’s somewhere between morphing and switching the wavetables knob..
ok one wavetable per OSC would be nice.. but it’s a non realistic dream..
ok.. the Wave is cool.. and analog now.. but a Wave 2 should grow overtime..
individual Wavetables for each of the OSCs..
samples / attacksamples.. and a good connection to the outer world.. SCSI,USB..?.. of course .. all those thing I have on my site (www.sequencer.de)..
most cool… but too xpensive.. displays under every knob.. (a dream..
so it could be extended and maybe completely free..
for the 2 (or more) filters and all those cool params..
in the end it will be a matter of intelligent design & prices.. true!! hmm.. when I think about all that I get the idea of a very desirable synth..
the only thing I really miss (had to sell my Nord for getting my Q!).. please not on the Wave 2 only!!.. -> wishlist for Q & XT,too!!! be cool and you need a sampler..“..
desired, save it and simply plug in different sample sets. I always wondered why no company has ever made a sampler with knobs.. that means : the normal synthesis knobs plus: start,pos,end and some more nice things!!.. ok they can be assigned sometimes.. but no more!!!.. This could be a knobbed W-sampler that could store and handle its samples as algorithms like the axcel technos or so… and: there coud be knobbed funktions to morph between samples.. and nice add. like implementing grains and the like… and: it should be modular!! THAT would be nice, eh? of course it should have some addives in ROM.. the others in RAM (n.off of it!!!) and if there is an editor: please never forget the Macs!!! > > Why doesn’t Waldorf join up with Yamaha or Akai to mount a simple stripped down Q engine into one of their samplers? A multitimberal sampler with the ability to generate it’s own samples from an onboard VA engine seems to make sense to me and be the next step in sampler evolution. Sounds like a good way to sell Q boards as well. A Q board mounted in the sampler with an external knob box similar to the Access products would be all that is needed. Ultimately, I would like to see a machine with a K5000s-like additive engine and a Waldorf VA engine. 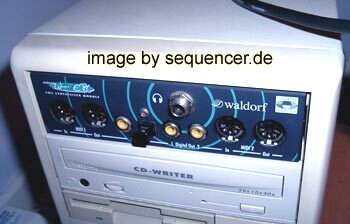 The sounds would be produced using the Waldorf VA then analysed by the additive synthesis engine and replayed. Sort of like a Synclavier. It would be really cool if the VA part was a „plug in“ so that you could use Q,Pulse,XT, Wave2000…etc and still store the sounds in the Additives‘ banks.